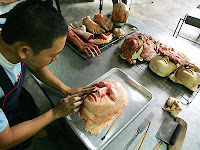 A pastry chef from thailand bake in the appearance of part of the human body, will you still eat it? If you can get past the cannabilistic queasiness that’s probably churning around inside of you, you might find the bread to be quite tasty—it’s made from dough, raisins, cashews, and chocolate. Unarrom, who holds a master’s degree in fine arts, uses the family bakery as a workshop for his culinary creativity, where he transforms innocent loaves into something straight out of the Saw movie series. Do you think this is a nice art ?